Oh, yeah. That pesky bio-physical 42 week sonogram. The entire time the sono technician was doing the exam, I was basically staring blankly at the wall in a semi-catatonic state. I’ve had several sonograms with this guy, and he’s a super pleasant, chatty, funny fella. Usually, Shaun and I banter with him, but I just didn’t have it in me at the time. I had put on the exact same outfit that I wore to our movie date the night before–down to the same earrings I wore–not because I felt like dressing up (quite the opposite) but because it required zero mental energy. So, while I looked fairly normal–probably a little too dressed up, given the circumstances–I felt anything BUT normal. Thankfully, the sonogram didn’t reveal anything alarming. Yes, my placenta was starting to calcify, as 42 + week placentas are wont to do, and my amniotic fluid was a tad low (again, typical for “overdue”) but nothing that would require me to give birth immediately. I would say I was relieved, but I think “numb” was a little more accurate. Once the sonogram was over, my midwife asked me to tell her how I was feeling. I didn’t feel physically capable of doing childbirth, but I still wanted it done because I couldn’t imagine staying up all night again with contractions that did nothing. I just couldn’t seem to figure out how to make that happen. AND, as had been the norm for the last two days, I felt like an elephant named Anxiety was sitting on my chest. Melena proceeded to do what she does best–listen, assess, commiserate, and suggest something practical. In this case, that something practical was a homeopathic tincture called Rescue Remedy. It’s supposed to help with stress and anxiety. I had no idea if it would work, but I was willing to try just about anything new at that point. Within a few minutes of taking the tincture, I had a hard contraction. Not that I cared. I’d had plenty of those over the past week plus. So, I basically just ignored it. Melena told me we needed to talk about logistics for the next several hours and days. She had scheduled a shift (she’s a nurse as well as a midwife) for that Thursday and told me that, if I didn’t have Shiloh by Thursday morning, I wouldn’t be getting her as my midwife. The prospect made me sad, but I still wasn’t processing anything normally, so I don’t think the information completely registered. Somewhere during this conversation, I had another contraction. These were the two single closest together contractions I’d had since they started over a week before. But I still wasn’t feeling hopeful. I was, however, feeling a little better. The Anxiety elephant had lost a few pounds, and my chest didn’t feel nearly as smothered. It wasn’t much, but it was still an improvement. It appeared the tincture might be working. Of course, then Melena suggested my taking something to help me sleep and going home to try to rest. My response to that was viscerally negative. I couldn’t imagine lying down again in my quiet house and trying to go into labor. I told her as much, and she asked me if I was sure that I wanted this baby to be a home birth. That stopped me short. Well, that and another contraction–the 3rd in 15 minutes. I told her that I didn’t want a hospital birth if I could avoid it but that I didn’t know if I could avoid it if I kept on like I was. 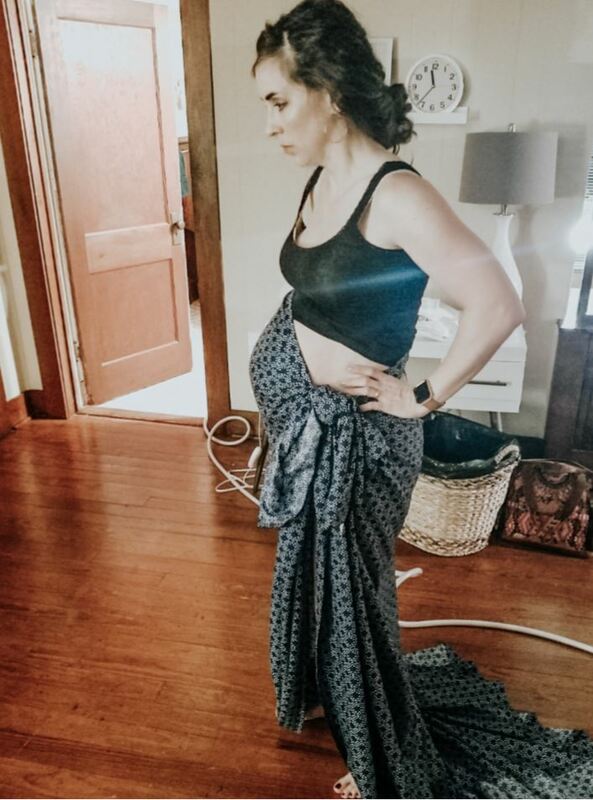 Melena told me she wasn’t worried about a home birth–just wanted to make sure it was still my desire–and then asked if I wanted to know how dilated I was. I sort of didn’t, but I said yes anyway. I told myself that I would be happy with any progress, but I was really hoping I was at least a 4. Turns out, that’s exactly what I was. Huge sigh of relief. When Melena left the room to check on something, Shaun told me that he had every confidence that, even though I didn’t feel like I had the energy to do labor, the Lord would give me what I needed when the time came. By this point, I didn’t feel nearly as physically depleted or stressed as I had even half an hour earlier, and I said something like, “I know he will. But I feel like, if I could just do something completely different–something that would shock my mind out of this rut of hopelessness that it’s in–my energy would come back.” I wondered if I should call up some girlfriends to go to dinner, or…something. I still didn’t have an appetite, though, and, the prospect of dinner with friends while contracting wasn’t super-appealing. It was such a light bulb moment. In that instant, it occurred to me that I didn’t want to go home. THIS was the something different that I needed to get out of my funk. My energy levels and excitement started to rise. I followed her upstairs and took a brief “tour” of the birth room…something I had never done since all of my midwife births have been at home. It was just like the rest of Melena’s lovely practice: homey and welcoming, with pops of color and rad mid-century modern furniture. I felt immediately at ease. Anxiety, the elephant, had shrunk down to the size of a mouse and scampered away. And he didn’t come back again. Just as if they’d been planning to do this all along, Melena and her awesome birth assistant, Rachel (who–believe it or not–had followed my blog for years before we ever met and had been pregnant with me at the same time as both Honor and Theo) settled into chairs in the birth center and proceeded to chat with me in the most relaxed fashion, while I continued to contract steadily. It felt like we were just three girlfriends (plus Shaun) hanging out…with a side of labor pains. Between contractions, Rachel ran me through a series of Spinning Babies positions (inversions + stretches to help get the baby in optimal position), and, at some point, Shaun left to grab a pizza. He’s always such a steady source of support and encouragement during my entire labors, no matter how long they are. But man cannot live on Lara bars and Clementines alone (all I had been able to choke down all day), so he was definitely in need of some more substantial sustenance. By the time he came back, I’d been contracting regularly for a good three hours, since that first one after the sonogram. The contractions still weren’t much closer together, but they were getting stronger, and at least they hadn’t stopped. Until they did. Whomp, whomp. Okay, so that’s not completely accurate. But at some point, they started coming fewer and farther between, and I started getting a little worried. I wasn’t anxious, exactly, but I did start feeling a little silly sitting around chatting, waiting for a contraction every 10 minutes. I despise inconveniencing people. Pretty much to a fault. And for the hour that my contractions slowed down, I felt very much like I was holding my midwives hostage, which made me antsy. Of course, then Melena reminded me that a) this is normal for my slow body and b) she was there doing what she was paid to do, so I had no need to feel like a mooch. Duh. It’s amazing how much our hormones can obscure some pretty obvious facts when they’re out of whack. After a few more spread apart contractions, I knew what I would have to do to get them going again, so, as much as I dreaded it, I forced myself to climb in the bed, lie flat on my back, with my legs butterflied out, just like I had in the wee hours of the morning for three hours, and just breeeeeeathe the contractions down. But here’s the thing: after 7 labors, I have discovered something about my body. I can spend the vast majority of my labor marching and squatting and swaying and such. And I do. Every time. I definitely let gravity do the majority of the hard work. And I’m not afraid to get in positions that really make those contractions effective. Or at least I’m not anymore (it took a few labors to get rid of that fear). HOWEVER. There comes a certain point in every labor in which I am not making as much progress as I should because I have gotten a little too good at controlling the pain. And lying on my back forces me (now that I’ve learned how) to relax every muscle in my lower body and just let the contractions do their job. Is it fun? Nope. Not at all. It’s very vulnerable and unpleasant in many ways. But can I tell that it’s working? Yup. Every time. And when you have long labors like mine, you learn to embrace the contractions that get you the baby just a bit faster. So! I stayed there and focused on breathing the baby down and mentally turning all of my lower muscles into Jell-o for a good (bad!) 2 and 1/2 hours. As the contractions increased in intensity and duration (at the end of this session, they were almost 2 minutes long), Shaun lay beside me on the bed, occasionally squeezing my hand when my breathing got really labored but mostly just being there, which I love. I kept telling myself I could make it another 30 minutes, until, finally, I decided that 11 PM was my limit. I would ask my midwives to fill the birthing tub then. The best part about all of this? In between contractions, my mind was completely free of worry and exhaustion. I felt so present, and even though the contractions hurt like the Dickens, they weren’t overwhelming me. This felt like such a gift after days of fighting mental overwhelm. My midwives had been downstairs, giving me space, during the majority of this whole contracting-on-the-bed business, except to come up and regularly check my vitals and Shiloh’s heart tones. But when I asked for the pool to be filled, Melena offered to check me for progress. I knew I’d made some but was thrilled when she announced that I was almost an 8. It ended up taking about an hour for the birth pool to fill up because someone had lowered the thermostat on the water heater without Melena’s knowing it, and we ran out of hot water about halfway through. So, I walked around contracting and squatting through some pretty intense pains…still feeling very self-contained and calm in between each one. With every labor except one (Honor’s, which was really intense for the last section, thanks to the fact that my water was broken), each time I’ve attempted to labor in the water, it has killed my contractions. I was hoping that trend wouldn’t continue this time. 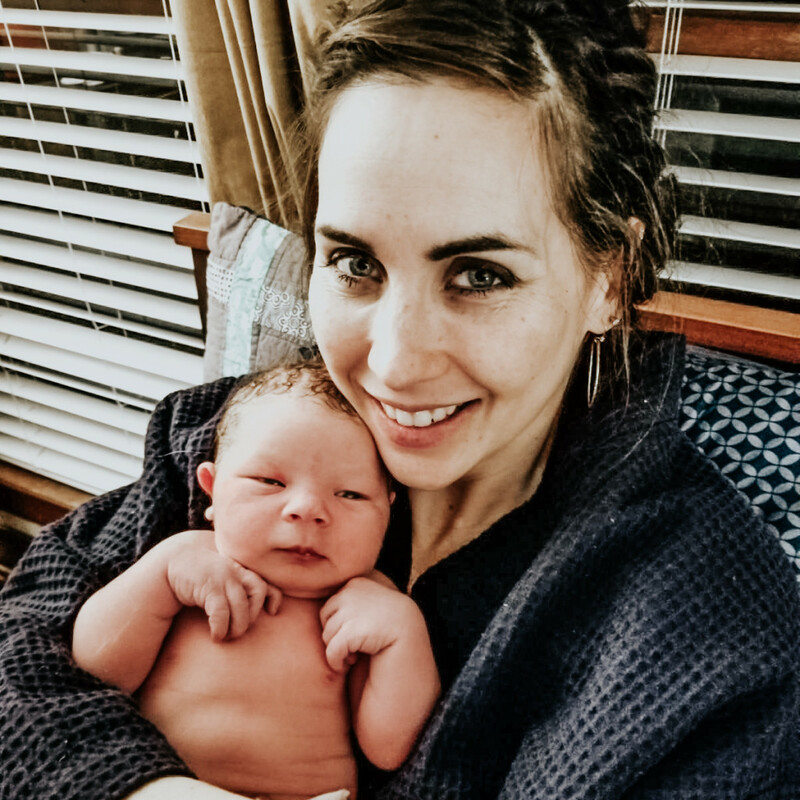 When I first got in the tub, it seemed like maybe my contractions had indeed been scared away, since I didn’t have another one for a good 7 minutes. But then, they started/kept coming…albeit more spread out. So spread out, in fact, that, for the four hours that I stayed in that tub, they never came closer than 5 minutes apart. You better believe it was a nice break after hours of constant contracting. But it was also a bit frustrating. Just in case you’ve never labored in water, it does an amazing job of alleviating pressure and the pull of gravity, while still producing effective contractions. Except. (Why is there pretty much always an “except” in my labors??). Except, I basically spent those four hours feeling like I was fighting to push against…not much. My contractions had shortened and were gone before I could really get some good traction for pushing. It was also hard to tell whether my body was pushing on its own. It was definitely bearing down a lot in the sort-of-sitting-sort-of-reclining position I was in. I would even feel a good deal of bulging/burning with each contraction. But they never lasted long enough to actually engage his head enough to get him out. With each half hour that passed, the contractions increased in intensity…as did my exhaustion. Not so much physical. I still felt fine. But I was getting sleepy, yo. So was everybody else. At one point, Melena had me get out of the tub to pee, and I experienced the dreaded “toilet contraction” (the world’s most vulnerable position other than lying flat on your back). It was pretty terrible. But I discovered something rather disappointing. His head still wasn’t engaged enough to trigger that automatic pushing urge. I got back in the tub, thinking that surely it would eventually intensify enough to pull the trigger. But that sleepiness was a very real thing at this point, and I was nodding off in between contractions. During one of those drowsy moments, we were all suddenly jerked back to consciousness by a loud WHAM!! Turns out my sweet, devoted, stays-up-all-night-while-I-labor husband had fallen dead asleep on his perch on a stool behind me and fallen back, slamming his head against the wall. Don’t worry, he was fine. But it was quite the jolt of adrenaline (and humor) for all of us. Once I was fully awake again (thanks, babe), I was just ready to get the show back on the road. I didn’t know whether I was fully dilated, but I was guessing so, and I knew that, as hard as the contractions were in the tub, they were going to be even nastier out of it, which would finish the dilation double-quick if necessary. I gave myself a deadline of 4 AM to get out of the tub, but my midwife sent me to pee once again around 3:45. I didn’t have a contraction immediately like I had before, but I forced myself to wait for one, leaning my head against the wall and just surviving it as it came. Even so, I still didn’t experience that big shift I was waiting for. I walked around through a few more brutal contractions, and then Melena suggested that I try a hands and knees position with the birthing ball under my chest. I honestly didn’t want to. I’ve labored on hands and knees before, and I don’t love it. But I make it a policy to at least try whatever position my midwife suggests because I trust her. Y’all. That was the single most painful and effective contraction of the entire labor. I felt the baby literally descend like a stick shift being moved into gear. The sound effect in my brain as I type this sentence is Ker-KLUNK. It was NO fun, and, as much as I felt completely trapped in that position, since I could practically feel him crowning, I also wasn’t looking forward to doing another one of those. Thankfully, that huge shift was the worst of it. Melena, midwife that she is, was euphoric, saying things like: “Now, that was a good contraction,” and, “Hey, look at that! You’re finally making noise!” (She likes to tease me that she has a hard time telling how bad my contractions really are because I don’t vocalize much, but there was definitely some panting/gasping/whimpering going on here). The next 20 minutes or so was pushing with each contraction that came (they still weren’t on top of each other; more like 2-3 minutes apart), but the contractions were frustratingly short. I kept running out of contraction before I was done pushing. Each time, Melena would tell me to stop pushing if I didn’t still have a contraction (because I tend to try to muscle it through if possible). But after he had descended and then regressed several times, I gave the biggest push yet through a strong contraction and felt him crowning. The contraction waned, but I heard Melena ask me to keep going. Her voice was calm, but I knew that if she was encouraging me to push without a contraction, something was up. I would love to say that he just slid out, but, instead, I fought for several long moments, breath held, chin to chest, eyes squeezed tight as I felt him emerge bit by bit (such an excruciatingly strange sensation). Throughout it all, I could hear Melena gently encouraging me to keep going, and Shaun, whose hands I was gripping in a death-vice saying, “He’s almost here! You’re almost done! You’re doing so great!” (Whoa. I just unexpectedly teared up remembering that part…hence why I take the time to write all of this down in ridiculous detail). Finally, he was out at 4:17 AM, and Melena handed him to me, producing this moment, which I’m so glad I have captured forever. Is there ANY better feeling in the world than holding your baby for the first time? I think not. Of course, realizing that means you’re not pregnant anymore is a close second…for me, at least. When I asked Melena what was going on at the very end there, she said that Shiloh’s heart rate had dropped dramatically, and I really needed to get him out. As scary as that was to hear, I was grateful for having been able to have an entirely uneventful labor (assuming we ignore all of the lead-up stuff) up until those last few minutes. And I was even more grateful that the Lord hadn’t answered my prayers to get the labor going before I got to the birth center because I couldn’t have imagined a better place to have this baby. Of course, even though I was still wearing the earrings that I’d arrived in a good 13 hours before (because I was a wee bit too focused on getting a baby out to remember to take them out), I didn’t have any other clothes–either for me or for Shiloh. We didn’t even have diapers or a car seat or anything. So, after literally hand-feeding me the last two pieces of leftover pizza (which tasted HEAVENLY) and having some bonding time with his 5th (!) son, Shaun drove home–dead tired, poor man–and got a few necessary things, so we could head home for good. To say that I’ll never forget this birth is a bit of an understatement. The whole experience stretched me in so many ways (many of them literal #ringoffire), but I’m so grateful for how the Lord orchestrated each detail–even the ones that I didn’t love at the time. Only he knows whether he’ll bless us with anymore kids, but I know that, if he does, I’ll be rereading this story as a testament of his faithfulness in the smallest (and largest) of circumstances. Anybody else ever “accidentally” given birth somewhere they hadn’t planned on? Were you wearing earrings? I’d love to hear your story! Which means that my womb is just more stubborn than most. Color me unsurprised. Here’s the thing: I’m no stranger to prodomal (false/build-up/practice/mean-spirited…pick your synonym) labor. With my first, I had none. Not one single contraction. With the rest, it’s been weeks upon weeks. I started Braxton Hicks-ing with Theo at 19 weeks. Joy. But I know enough to completely ignore all of that nonsense. Honestly, it barely registers anymore. When I start paying even a tiny bit of attention is when the contractions start squeezing a littttttle harder, hurting a little more, and developing some kind of pattern. This usually starts around 35 weeks. And again, I largely ignore them for the next 7 or so. This time, though, I didn’t have too much of that until week 40. And I was really grateful. Braxton Hicks are easy to roll your eyes at. Legit prodromal labor sets you on edge because, even though you know that there’s nothing doing until you’re in severe pain, you can still spend most of your day contracting somewhat painfully at regular intervals. Which is what I started to do. I remember sitting at our homeschool co-op the Monday that marked 40 weeks for me, idly timing contractions that were anywhere between 15 to 20 minutes apart and at least a minute long. They weren’t particularly painful, but I could tell that, if they continued and got stronger/closer together, we might be in business. Turns out we weren’t. Not that day. And not the next or the next or the next. Any other labor, we might have been, but these were just messing with my head, so I stopped paying them any mind and went about my business. There was plenty to keep me occupied–homeschooling, exercise classes, birthdays, and the like. In fact, I started wishing that I had fewerthings going on, just in case my body was holding out for that next event or something equally (and yet predictably) goofy. Of course, through all of this, my mind kept reminding me that I have gone to 42 weeks (exactly) 3 times (and 12 days over once). And I wasn’t there yet. So, I wasn’t “due” yet. Also, I was fighting something I never had before: anxiety over giving birth. Don’t get me wrong. I always dread childbirth. It’s not a fun thing. I know some people say they enjoy it, and more power to them! I think of it entirely as a means to an end. I do the pain, I get a baby. Worth it. And by the time I’m due or “overdue,” I’m just ready–grimly excited even–to get it over with. This time, though, I could barely think about birth without a vice of panic beginning to tighten around my chest. So, I just didn’t think about it. I mean, what would be the point? And I made myself Scripture cards of encouragement, which I read through nightly (because the anxiety always worsened the closer to bedtime it got). One thing I had prayed for steadily throughout this pregnancy was that I would able to do labor without my water breaking. It broke early in the morning with Honor’s birth, if you recall, and although the day before I actually had him wasn’t that painful, when his labor actually kicked in, it was a freight train and so painful that I can’t really think about it without shuddering. So, when one morning, I sat up and experienced a small gush of liquid, I felt a jolt of fear, then resignation. Welp. Here we go, I thought. Turns out my water hadn’t broken, though. Neither had I had peed myself (phew). Instead, due to some fun hormonal thing or another, my body had just decided to release some liquid. Fun! This was new. It proceeded to keep doing this for over a week, and, while I learned to ignore it, it was yet another layer of, “Huh, this is confusing,” to add to the mix. By 41 and 1/2 weeks, I was pretty over all of the contractions and the stress of dreading labor. Actually, during the day, I was fine. But, at night, I found myself fighting off several rounds of panic with my Scripture cards/prayer. I could achieve temporary calm, but I still couldn’t figure out any kind of pattern to all of this, and, as much as I wanted it done, I still didn’t have peace about labor. (Side note: I know we’re not supposed to worry, and you better believe I was doing all things Biblical to combat it, but I think there’s a reason that we’re told to take every thought “captive;” sometimes, it’s downright war). A few days after Shaun’s birthday (when he predicted Shiloh would come), I woke up in the middle of the night with contractions too painful to sleep through that still refused to get any closer than 10 minutes apart. I knew that, given how long my labors are, even if this was the real deal, I probably wouldn’t have him until well into the next day, which was fine with me because my midwife was unavailable until the following afternoon. I did my best to fall asleep for a few minutes between each one, but during a particularly nasty one, my eyes flew open as a rising panic began to fill my chest. My breath was short. My throat was closing down. And my thoughts were racing too fast to get under control on my own. I woke Shaun up, told him what was happening, and he helped me breath/pray/Scripture away the attack. I didn’t sleep well the rest of the night, but at least I wasn’t hyperventilating anymore. Of course, by the time I got up at 5 AM, I wasn’t really contracting anymore either. That night, I mentioned my anxious feelings on IG and was flooded with prayer and verse suggestions. It was the first night that I went to bed with zero worry in about a week, and I slept all night, waking up refreshed and ready to face the day. Oh, and did I happen to mention that this just so happened to be one of the more eventful weekends we had had in a while? Between Shaun’s birthday and my brother’s 40th 2 days later, we were running from one event to another, and my kids were alternating coming home for a night and then heading back to my mom’s when the contractions would start up again. Sunday, the day that I woke up calm and rested, the kids were with us, and we stayed home from church to recoup with a relaxing day together doing family church and playing games. That night, though, the contractions were back, keeping me awake from 1 AM on. I called my mom early Monday morning because she was on standby to cover for me at our homeschool co-op, and she came and picked up the kids for co-op. As they had several other mornings, my contractions weakened around 8 and were nothing more than a painful squeeze or two by 11 AM. Shaun had been working hard to catch up on his programming obligations to be relatively free for the birth, so we spent a peaceful, if confused, day at home playing Scrabble and, even at one point, climbing the giant hill behind our house so I could knock down some scrub trees with Shaun’s mini-excavator (it was his idea for me to get out my contraction aggression, and it totally worked for a bit). My mom and the kids were back by 4 PM, and I was having contractions regularly again. They were stronger but no closer together. Given my history of going into labor in the evening (and then laboring and laboring through the night and into the next day, at least), my mom suggested taking the kids back with her. Not going to lie: I was feeling like the world’s biggest mooch. I mean, what was the point? I wasn’t really in labor, and I had no idea when I would be. But my mom didn’t care. Her goal was to give me as peaceful of a laboring process (boy, what an understatement) as possible, and so she graciously hauled all 7 kids home with her again. Shaun and I had free movie tickets that were about to expire, so we somewhat half-heartedly went out for “one last date” to take our minds off of my contracting-but-not-really status. True to form, they limped along without gaining much momentum, as bedtime approached, and I fought yet another round of anxiety. This time, I was dreading going to sleep, since my bed was very much starting to feel like the enemy. Sure enough, about an hour after I managed to finally fall asleep, the contractions started…and kept coming…for hours. Determined to make the most of them, I lay flat on my back with my knees out and my heels pulled up toward me (which is pretty much the most vulnerable position in the world, so, of course, it’s the only thing that seemed to ramp them up) and focused on breathing them down deep into the pit of my belly, imagining the baby descending and relaxing my muscles as much as possible so that I could fall asleep at least briefly in between contractions. After 3 hours of telling myself I could do another 15 minutes, I couldn’t fall asleep for a minute longer. I got up and proceeded to wobble around on rubber legs, feeling sick to my stomach and as wrung out as a dirty dishrag. The contractions had, once again, pretty much stopped. I texted my midwife my status, and she suggested that I take Benadryl and try to get some sleep. Determined to go nowhere near my bed, I lay down on my side on the couch, waking up with a strong contraction every 15 minutes or so and breathing through them before falling back asleep. By this point, I was borderline depressed. 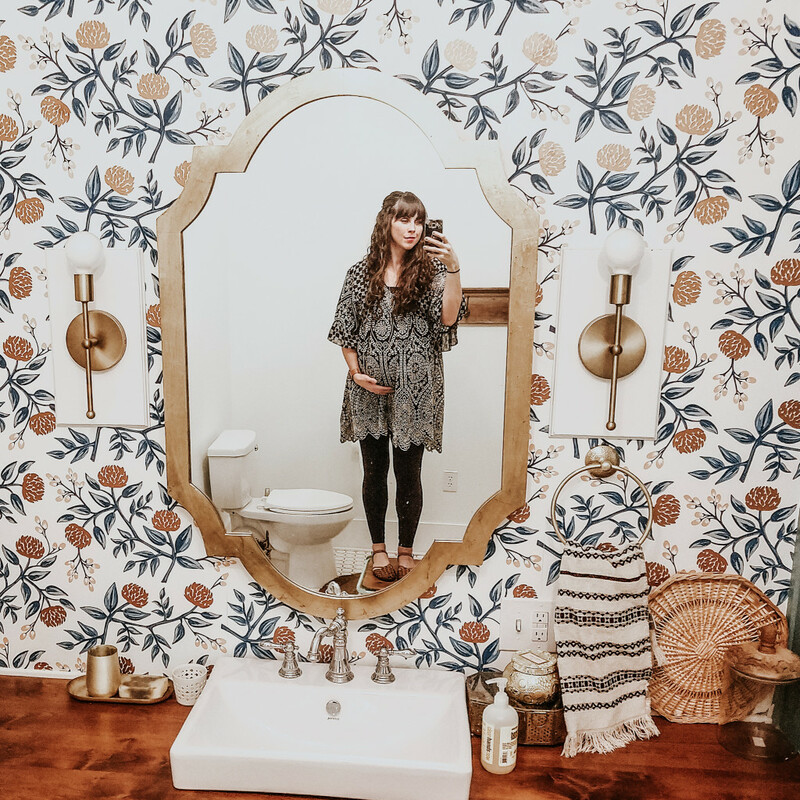 I had an appointment for a 42 week bio-physical sonogram to check the status of everything that afternoon, and I desperately wanted to go into labor before we left for that appointment. My exhausted brain kept telling me that, if I could do that, then I wouldn’t have to hear that the baby was 11 pounds or that there was a problem with the placenta or something equally disheartening (bc it really felt like “one more thing” that would do me in), but my even more exhausted body was telling me I couldn’t do real labor right then. My legs were Jell-o, and I couldn’t muster up enough appetite to eat anything more than a slice or two of apple, so my energy levels were zero. Are you depressed yet too? I wouldn’t blame you. Other than the the twins’ birth, the lead-up to this one was the most taxing, the most confusing, and the most frustrating I’ve had yet. I can’t imagine reading all of that was super-fun. Despite my rather desperate Hail Mary prayers, the Lord did not put me into labor like I asked. So, around 3 in the afternoon, we headed off for the appointment, which was about 30 minutes away. I dozed off on the way there, and–wouldn’t you know it?–the contractions that had stalled out yet again came back to wake me up. Aaaaaaannnnddd…that’ll have to do it for now, folks. Shiloh is waking up hinting strongly that he’d very much like a snack, and I have typed over 2,000 words about NOT being in labor. Don’t worry, though. I’ll type even more soon. Besides, the very fact that there’s a hungry baby keeping me from writing more means that this story has a happy ending, right? Of course, right.